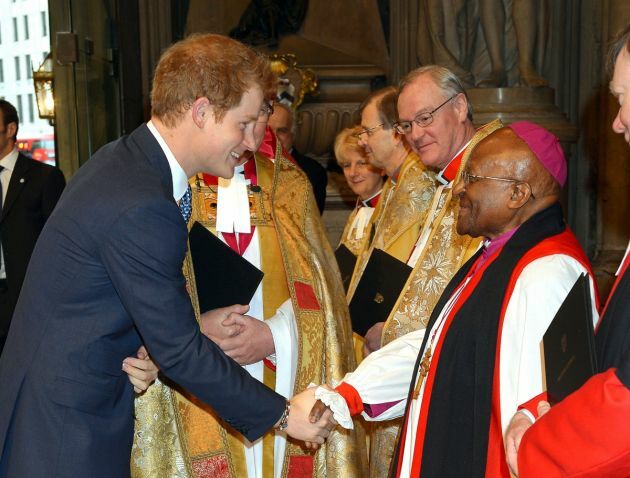 Britain's Prince Harry has conferred a high honor on Archbishop Emeritus Desmond Tutu on behalf of the United Kingdom during a visit to South Africa while doing charity work in the region. The grandson of Queen Elizabeth II, Prince Harry created a bit of a stir in the British media by declaring that he is "anti-selfie" as he refused to be photographed with a young woman in South Africa, The Telegraph reported. Responding to a request from a member of Desmond Tutu's entourage for a photograph, the fifth in line to the British throne said: "I'm afraid I'm anti-selfie." The Prince made the comments in the Desmond and Leah Tutu Legacy Foundation on the Cape waterfront, after presenting presented the retired archbishop, who is a Nobel Peace Prize laureate, with the Order of the Companion of Honor. 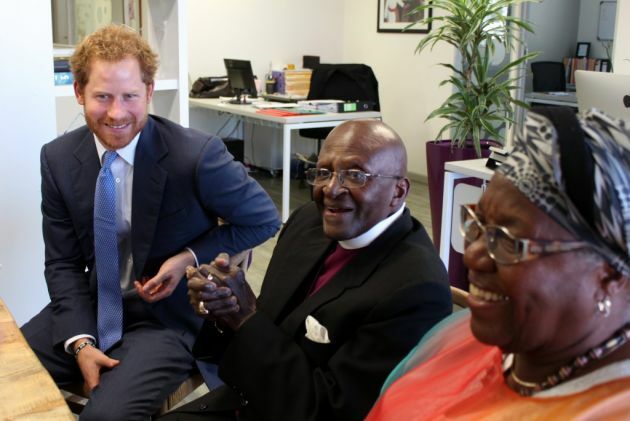 Harry presented Tutu with the honor at the offices of The Desmond & Leah Tutu Legacy Foundation in Cape Town on the first day of his visit to South Africa, Nov. 30. Order of the "Companions of Honour" was instituted in 1917 by King George V. It is conferred on people for recognized services of national importance, for a pre-eminent and sustained contribution in the arts, science, medicine or government. Other recipients include painter Lucian Freud, Prof. Stephen Hawking, naturalist Sir David Attenborough, painter David Hockney, historian Dr. Eric Hobsbawm, politicians Sir John Major and Lord Patten of Barnes, General John de Chastelain, dramatist Harold Pinter, conductor Sir Charles Mackerras, Rev. Chad Varah, and scientist Prof. Anthony Pawson. The archbishop has recently suffered ill health and looked frail but was smiling during the prince's visit to the offices of the Desmond and Leah Tutu Legacy Foundation in Cape Town. Tutu, the former Anglican Archbishop of Cape Town was a scourge for the apartheid authorities in South Africa during the 1970s and 1980s and was awarded the Nobel Peace prize in 1984. He has been in and out of hospital in recent months suffering from infections related to prostate cancer. The archbishop praised the prince for his charity work in Africa. Tutu said: "I am very touched by your commitment to Lesotho. I taught at the university there and became Bishop of Lesotho," Sky News reported. "It has always had a very soft spot in our hearts ... just wonderful that you and the English are helping, thank you very much." The prince replied: "You will have to come and visit one of our projects." Tutu's Daughter, Rev. Canon Mpho Tutu, the executive director of the Desmond and Lead Tutu Legacy Foundation, said the prince's visit to Khayelitsha would show the prince how many people in Cape Town live. Khayelitsha was built as a black township during the apartheid era and lies 20 kilometers (12 miles) from Cape Town's center located on the Cape Flats with a population of some 400,000 people many of whom live in informal settlements. Prince Harry visited a youth center helping young people stay away from gangs and crime.